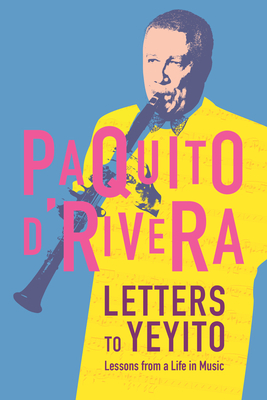 Years after receiving a fan letter with no return address, Latin jazz legend Paquito D’Rivera began to write Letters to Yeyito in the hope of reaching its author, a would-be musician. In the course of advising his Cuban compatriot on love, life, and musicianship, D’Rivera recounts his own six-decade-long journey in the arts. After persevering under Castro’s brand of socialism for years, D’Rivera defected from Cuba and left his beloved Havana for that other great city: New York. From there, the saxophonist, clarinetist, and composer launched a dazzling—and still very active—career that has included fourteen Grammys, world tours, and extensive collaboration with the likes of Dizzy Gillespie, Yo-Yo Ma, and other music legends who make cameos in these pages. Full of humor, entertaining anecdotes, expert advice, and the musician’s characteristic exuberance, D’Rivera’s story is one of life on the move and finding a home in music. Cuban-born clarinetist and saxophonist Paquito D’Rivera is celebrated for his artistry in Latin jazz and achievements in classical composition. He has received fourteen Grammys, the NEA Jazz Masters Award, and the National Medal of the Arts, among many others, and is the only artist to have won Grammys in both Classical and Latin Jazz categories. His numerous recordings include more than thirty solo albums. He lives in New Jersey. Rosario Moreno is a Cuban-born bilingual translator, writer, creative director, and executive producer. A U.S. Hispanic Market Specialist, she has worked for both the Univision and Telemundo networks and produced over one hundred TV commercials and programs, as well as numerous advertising and merchandising campaigns. She translates both from English to Spanish and from Spanish to English.